Shri Shivabalayogi Maharaj, the spiritual colossus of India, illuminated the world with His wisdom and grace. 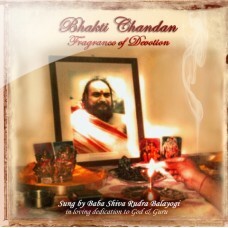 In Bhakti Chandan, a beautiful compilation of live bhajans, His direct disciple, Shri Babaji condenses a lifetime of love for the Master into a stirring tribute. A clue to the nature of a Self Realized Yogi - liberated, ever-free, though eternally bound to the Guru - Shri Babaji’s songs of glory to God and Guru permeate one’s heart and life with the fragrance of devotion. From the age of sixteen, when He fell in love with His Guru at first sight, Shri Babaji has performed every act as a form of worship. From taking sannyas (monkhood) to sweeping the floors of His Guru’s Ashram, from caring for the needs of Ashram guests and devotees to meditating for hours on end in the Ashram orchards, every act has been saturated with devotion and offered with total surrender to the Lotus Feet of the Divine Guru. Shri Babaji’s unique style of singing, accompanied by professional classical Indian musicians, transports the listener to the magnificent scene of the Dehradun Ashram, cloaked in the ancient mist of the Himalayas and steeped in the incense of meditation and devotion. For spiritual seekers around the world, this is the sacred home of Babaji’s sadhana and Tapas – His life of total dedication and devotion to the Divine Guru. Each song in this compilation has a special significance in the ineffable relationship between Shri Babaji and His Divine Guru, Shri Swamiji. One can imagine Shri Babaji as a young sannyasin, composing and playing bhajans in honor of His Guru and God every evening, whether or not any one else was present. It was a duty that helped transform Him into a Self Realized Yogi. When Shri Swamiji visited the Dehradun Ashram, Babaji would often sing these bhajans for Him, both during the public gatherings and during the time they spent alone on the Ashram terrace. Even today, years after the physical passing of His Guru, Shri Babaji wakes every morning to the footsteps of Shri Swamiji, calling Him to spread His message of universal peace through meditation, love and devotion. "Bhakti is like the diamond cutting the diamond. It is the imagination of the Divinity which brings all other imaginations into single pointedness. The scattered mind and its inseparable energy get tapped into Oneness. Chandan is sandalwood, used here to symbolize the fragrance of devotion. The height of devotion is when this imagination about the Divine merges into the Divinity that is beyond all imaginations. That is the Liberation."